This entry was posted on 06:30 and is filed under NaBloPoMo . You can follow any responses to this entry through the RSS 2.0 feed. You can leave a response, or trackback from your own site. Man, nowhere near as fun as yours. Want to swap, you can have my newly painted feature wall? I'm new and I wouldn't know, but are you guys sisters?! Cos you smile alike! That Superman one looks like a bunch of fun! looks like you guys had so much fun! jealous!! Love your pictures! At least you didn't have to use the motion sickness bags! It looks fab - I'm so jealous of your sunshine! Squeee! Looks like such a fun time! Also, can I just say as an American, I find the term "swimming costume" completely precious! Sounds like a awesome weekend! Your second bullet point about screaming out TROY made me laugh so hard. When a bunch of friends and I went to Six Flags last year, we were going on the Batman ride and everyone kept screaming, "I LOVE EMOTICONS" randomly. It made sense to us but everyone else probably thought we were insane! Glad you had such a great vacation weekend! Sounds and looks like an awesome weekend!!! I could totally use an air sick bag right now. Stupid painkillers. Anyway, it looks like you gals are having a great time! I'm so happy fer ya, enjoy it! Your trip sounds like a great time! I love amusement parks and roller coasters! Looks like you had an awesome time, chicky! Sad to hear that Dreamworld was a let down for you - I haven't been for a couple of years, but when I went it was pretty good... Maybe it's just going to hell in a handbasket. You should totally go to Wet'n'Wild (that's a waterpark, for the non-Aussies! haha) the last time I went there it was absolutely mental! You looked super cute in those pictures. :) Looks like fun! I must say that I love the language differences. 'Swimming costume' = awesome. Hi, Stumbled on your blog. You have some really fun posts! The collage of you weekend looks great...tells a wonderful story. I'm so proud of myself for going on those rides. Good times. I heart you, Aly. and I really heart "swimming costume" I think that will be my catch phrase of the day. i too laugh out loud at blogs. and i admit that i just laughed out loud at your confuscius says. 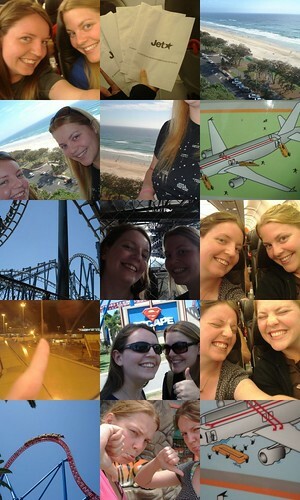 i've been to the gold coast twice this year but am yet to go to a theme park. white water world sounds fun though! i'm moving to brissie in a few weeks so they won't be far away... something to do this summer! yay!